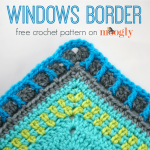 The Polka Dot Border was what I used to finish off my 2014 Moogly Crochet Along blanket! 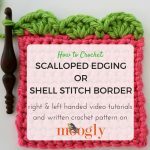 And whether you’re finishing up a CAL or just looking to add a special touch to a project, this edging is a fun and versatile choice! 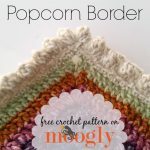 So here’s how to crochet the Polka Dot Border. The Polka Dot Border works well on afghans, bowls and baskets, ponchos… anywhere you can add an edging! The set up row doesn’t always require the perfect stitch count – skip just 1 stitch for the last repeat, if needed to make it work! 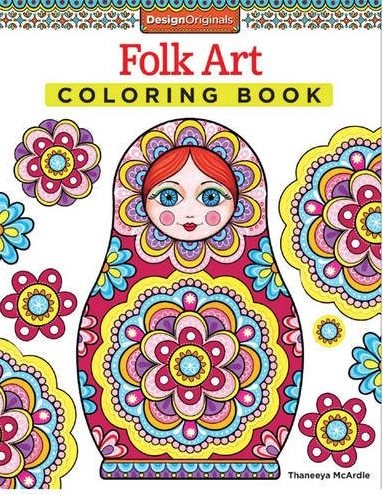 And play with color! In the photo above, I used the same color for the outside of the project, the setup row, and the background row, so the dots and final round really pop. But then in the video, I used different colors throughout – also super fun! I hope you enjoyed this tutorial video, and that it’s given you a little bit of inspiration on how you can add the Polka Dot Border to your next project! Gorgeous! thanks for sharing with such detail and personalizing for left or right handers. 🙂 Thank you, I’m glad you like it! I love this border! I want to try it on a blanket made up of granny squares – could I start directly with the set up round or should I do a round of sc to make the sides more straight/even where the granny squares meet?